It's just another day at the dentist's office for Victoria Trumbull when fellow patient, wealthy Mrs. Wilmington, dies. It's an unfortunate, though seemingly not murderous incident, but the receptionist is hysterical, so one of the dental assistants offers to drive her home. But after making a quick pit stop, he finds her body floating in the harbor. With the police shorthanded due to an upcoming presidential visit, it's up to Victoria to take on the case. As she wrestles with her ex-son-in-law, a $3 million will, and a deadly dental clinic, Mrs. Trumbull discovers that nothing in the case is quite what it seems. 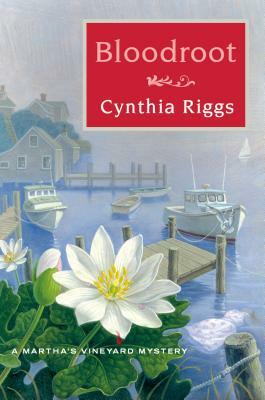 Bloodroot is the latest in Cynthia Riggs' longstanding Martha's Vineyard mystery series, filled with delightful characters and charming descriptions of the beautiful island. CYNTHIA RIGGS is the author of the Martha’s Vineyard mystery series and the guidebook Victoria Trumbull’s Martha’s Vineyard. She started writing the series while earning her MFA at Vermont College at age 68. Prior to becoming an author, she qualified for the 1948 Olympic fencing team, was the seventh woman to set foot on the South Pole, and crossed the Atlantic twice in a thirty-two-foot sailboat. Riggs gives weekly lectures onboard tourist ships during the summer and shepherds two writing groups. She lives in West Tisbury, Massachusetts where she runs a bed and breakfast out of the homestead that has been in her family for eight generations.